The lines are getting longer and thicker day by day. And now an N950 of a friend of mine started to do the same thing. I wonder if this is happening to all of them? N9 is the only viable option for me with its own pros and cons. Hopefully it won’t disappear too quickly from the shops.. I use IRC and I want to be able to share photos there easily. For n900 I had implemented a sharing plugin and that worked nicely. When I got the n950 I of course wanted to do the same with that but it turned out to be a difficult task. For some reason I don’t get my icons visible, they are always shown as a red square. All hints about that are most welcome. As is testing and feedback of the plugin. The plugin settings are in Settings -> Applications -> Command-line Share, and from there you need to enable the plugin and set the command to be run. After that the sharing plugin is visible in the Gallery -> share. The source code can be found here and the corresponding forum thread here. After almost two years there’s a new version of the Ogg Support in the Fremantle Extras. The decoder code has changed completely. Where the old one used libvorbis and vorbisdec from the GStreamer base plugins, the new one uses libav (formerly FFmpeg) and gst-av from Felipe Contreras. The impact on performance should be significant because the vorbis decoder in libav is more efficient on the n900 than the libvorbis and Felipe’s gst-av also outperforms the vorbisdec. I’ve always liked the Scratchbox approach to cross-compiling. Run ./configure && make and you have an ARM binary, no need to explicitly tell the configure we are cross-compiling nor fix the bad behaving build scripts. MeeGo doesn’t provide an SDK for the (ARM) platform. There’s an SDK for building Qt applications and there’s an QEMU for emulating the ARM device environment. For building the lower level components (Qt itself, GStreamer, etc) you are expected to use OBS. OBS is a very good build infrastructure tool, especially as you can link your own OBS to upstream OBS instances like MeeGo or OpenSUSE and have your OBS build only your own components or modified upstream components. But OBS is a bit overkill when you are developing your own component that you don’t want to be a part of anything bigger yet. The OBS client side tool, osc, allows you to build components locally in a chroot but still you need an OBS account and those aren’t automatically available for everyone, not even in the community OBS. 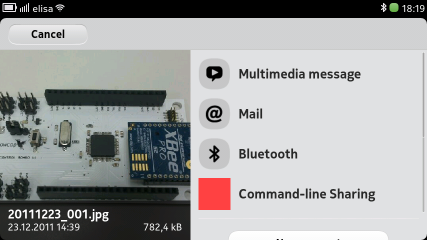 I took the chroot created by osc build and modified it a bit with the help from stskeeps @ #meego-arm. The produced chroot is capable of building ARMv7 hard-float binaries without OBS or OBS account. It includes a minimal set of dependencies to make it smaller for easy download (it’s still 162MB), and the project specific dependencies can be installed normally with zypper from the standard MeeGo repositories. The benefit from using a chroot over a QEMU image is the installed speed tools; many of the components taking time during a build are actually x86 binaries. These include e.g. bash, compilers and bzip2. Running these as emulated ARM binaries (or natively on an ARM hardware) would be much much slower. I’ve used this approach with my own Qt + GStreamer project and it has been working well but that’s only a small use case so there can be all kinds of issues still. I use the same account inside the chroot and outside and bind mount my $HOME to the chroot so I can build project under my $HOME. Zypper doesn’t find noarch packages (this is an upstream bug, not related to my chroot). Tested only on Debian Squeeze. 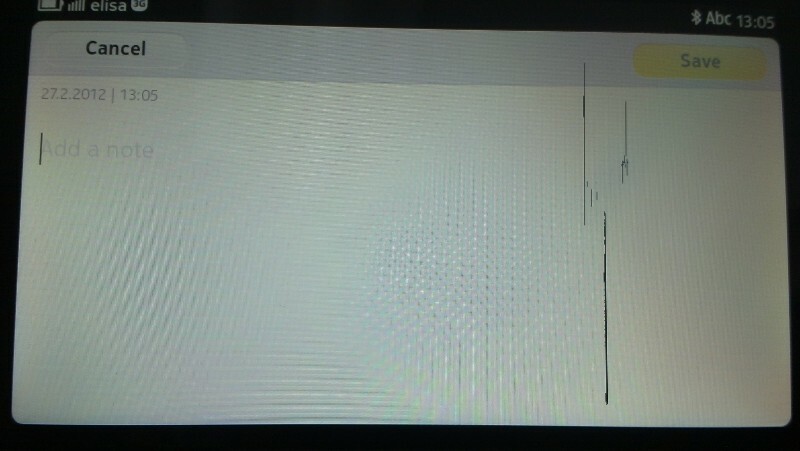 At some point there was a linker issue on Ubuntu and I don’t know if that still exists. My instructions mention libqt4-devel although the package name is libqt-devel. If you want to try it out, it’s available via BitTorrent at http://tuomas.kulve.fi/tmp/torrent/ (temporary location). After extracting the tarball, see the readme file in the root directory. Couple of photos of the earlier devices are shown in the project page. After several planning iterations and code rewrites I ended up using Qt both on the remote controlled Gumstix and on the GUI controller. I decided that trying to optimize everything from the memory and CPU consumption to the network bandwidth just isn’t worth the time spent in implementing it. The most CPU intensive task is the video encoding to H263 and that’s done in the DSP. I’m running MeeGo on the Gumstix and it provides e.g. the GStreamer plugins for the DSP. Using Qt framework with self made simple protocol over UDP I got the Phase01 code implemented quite quickly compared to my previous efforts. The protocol allows low priority packets (like periodic statistics and video stream) to be lost and guarantees the passing of high priority packets (control commands etc.). Also only the latest control command of each type is retransmitted, i.e. an old packet is not retransmitted if a new overriding command has already been given. The controller GUI shows the states the slave sends, like motor speeds, WLAN signal strength, CPU load average and some protocol statistics like round trip time and the number of retransmissions. Currently the motors are controlled using the a,s,d,w keys in 10% steps and the camera is controlled dragging the mouse left button pressed on top of the video window. Here’s a video (direct link) of the Phase01. You need HTML5 video capable browser with Ogg Theora/Vorbis codecs. I’ve always kept my computers up’n’running day and night although they are mostly idle during the time I sleep or labour at work. I’m too lazy to shutdown the whole thing few times a day and then but the electricity bill is getting quite big, so I started to think about suspending the computer. Of course the whole suspend feature has been used in laptops for ages but I guess not that much in Linux workstations. Occasionally I need to access my workstation remotely but that’s why there’s wake-on-lan and I still have my firewall computer always running. I installed a package called hibernate and configured it a bit to suspend to RAM instead of suspending to disk. It takes only a few seconds to come up from the suspended state and I have all my windows right where I left them. Only the network connections get cut off, which is a bit annoying as I use SSH for certain things. There have been one or two occasions during the over a hundred suspends I’ve done so far, where the workstation hasn’t come up without extra kicking. I measured the power consumption of two workstations with two different energy meters. One is a proper one from the electric company and one is a cheap one from a local store. I conducted one to three measurements for each state and in the table below are the typical values. Based on these results, you do save some power by suspending the computer (and the cheap meter is close to useless). The actual amount of saved electricity depends on the total consumption in the idle state. Newer computers have decent power management and my workstation doubles the consumption from 100W to over 200W when I e.g. start an 3D game. I reflashed my device and the biggest annoyance after restoring the backup was recompiling the sharing-cli plugin as it was not in any repository. Now it is. It has been working for me for several months without issues, although I’ve been sharing only medium size images over a decent connection. It might not succeed in sharing videos over GPRS. For hints about the usage, see the previous post. Thomas Perl made a proposal for creating a command line sharing plugin for the n900. I had already planned to implement something like that so I joined the project. I pushed the first “proof-of-concept” quality implementation to the GIT a month ago. I’ve been using it with the Irssi script (in the scripts directory) to get http URLs with meta information to IRC. The Irssi script needs to be modified to match the directories and IRC servers in use and both the script and the sharing plugin are still missing most of the error checking and extra functionality. Nevertheless, they’ve worked for me for the past weeks. There’s two times the %s as the local temporary file name doesn’t match the actual file name to be copied. And that assumes the SSH keys have been exchanged so that no passwords will be asked. There’s no debian packages yet as neither the script nor the plugin have been tested properly. Comments, testing and patches are welcome. 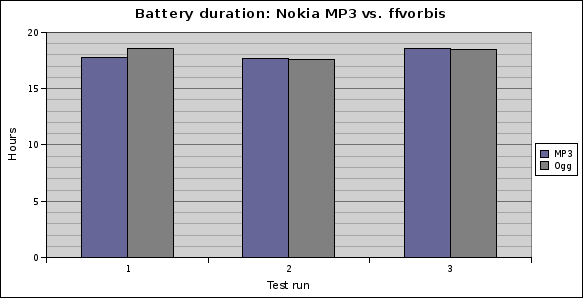 There have always been complaints about Ogg being more of a battery hog on the Nokia tablets compared to Nokia optimized MP3. I decided to measure the difference. All tests were run on a preproduction n900 device that Nokia distributed at the Maemo Summit. The software is the Maemo5 41-10 release which was already installed in the device. I installed Ogg Support, gst-av, ffmpeg and OpenSSH. Otherwise the device is the default 41-10 release. WLAN connection was configured but not activated during the tests. A SIM card was in place only in the SIM idle test. Before every test I charged the device, disconnected the charger once I noticed the green led, and rebooted the device. After the boot I started a simple script in the xterm. The script logged current time to a file, run “sync” command and slept 60 seconds after which it started the loop again. I run two idle tests between the libvorbis and ffvorbis tests but I’ll introduce the idle results first. First idle test was a generally idle device. I.e. it did have the default processes running but I didn’t start anything, except my logging script. During the test I did check a couple of times if the device was still on. The battery lasted for 93.8 hours. According to Igor Stoppa, there’s a cellmo sw bug that makes current higher without a SIM card. Therefore I rerun the idle test with a SIM card inserted. During the test I received two phone calls which I hung up, I received two SMS messages and wrote one. 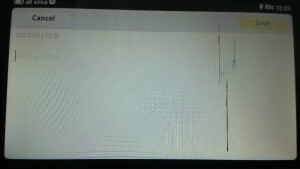 At one point the notification led was blinking for 45 mins. The battery laster for 93.6 hours. There’s probably a few hour error margin on those tests, so basically the battery lasted roughly a bit over 90 hours in both tests. Now that we know how long the device will last when idle we can move to the actual results. I run two sets of tests. First one was with the Ogg Support 1.0.5 from Extras and the second one with Felipe’s gst-av (2009-09-25) which is using vorbis decoder from FFmpeg (2009-09-07). I repeated both tests three times, running every other test with MP3 and every other with Ogg. After restarting the device with a fully charged battery I started the logging script in the xterm, started the File Manager and clicked on the MP3 or Ogg file which then started playing that single file in a loop in the Media Player. Both files were encoded with variable bitrate 192kbps settings. Volume of the device was set to minimum and no headphones were connected. Clearly while using libvorbis the CPU spents more time in lower sleep state and running with higher frequency. 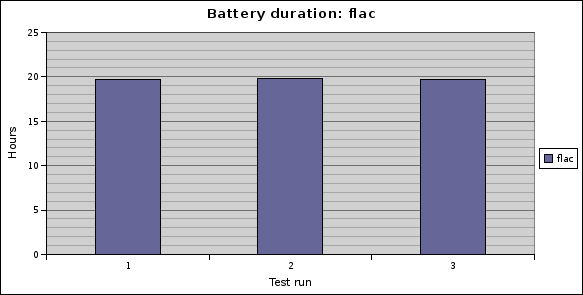 The following graph shows how this affects the battery. The battery lasts around 18 hours while playing MP3 but only around 11 hours while playing Ogg. 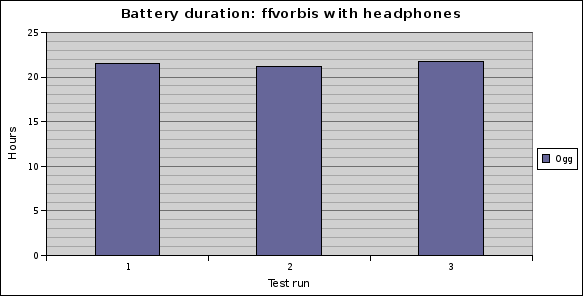 The average battery duration while using ffvorbis was slightly better than while using MP3 but probably well within the error margins. So basically they are equal when battery duration is concerned. It’s interesting to see how the situation changes in a year, will Nokia make better optimizations to their MP3 decoder than the community to the FFmpeg. These tests were run in a preproduction device with a pre-sales software. I’m sure the overall power management of the device will get (even?) better in the future software releases. 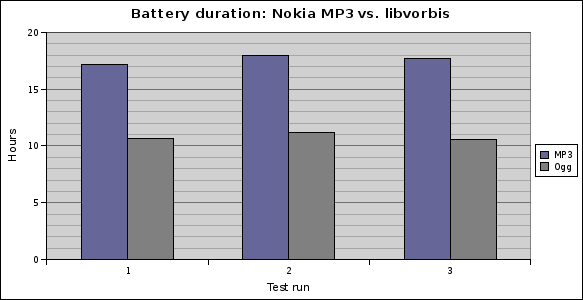 On the average the battery duration improved a bit over three hours. n900 with a pre-sales w41-10 software can run Flac roughly 1.5 hours longer than MP3. Purpose of the 1.0.5 release was to get a decent feature set to Extras repository before the Maemo Summit. There are still some bigger issues to be fixed in the future releases. There’s a product for Ogg Support at the Maemo Extras Bugzilla. I’ve added the major issues there but do report any other issues you find. Media Player and File Manager depend heavily on the open source Tracker for the meta data. Tracker has different meta data extractors for different mime types. GStreamer extractor is used by default for all audio/* and video/* mime types. The gstreamer extractor uses tagreadbin for getting the meta data from the media files. For better efficiency tagreadbin uses only parsers for getting the meta data. Decoders may need e.g. separate DSP hardware, so using decoders for getting the meta data could be a very slow and heavy process. Unfortunately Vorbis and Flac tags are not in the container and need a decoder for parsing them. Tracker provides a separate extractor for Vorbis that’s now packaged separately for Maemo by Ivan Frade. That’s not “product quality” and shouldn’t be used, so a proper solution will replace that one. The work for getting a tag parser for Vorbis and Flac to be used with tagreadbin has already been started. Hopefully the patch will be attached to the Gnome bugzilla at some point. Gstreamer’s playbin(2) element reports tags while playing the media file and this already works with Vorbis and Flac. MP and FM need to know the meta data before they start to play the file but e.g. the Media Widget on the Desktop seems to get the tags from the playbin2 as it shows the tags for Flac as well. The Vorbis decoder from xiph.org isn’t as fast as the FFmpeg’s Vorbis decoder on the n900. There weren’t any GStreamer plugins for the FFmpeg’s Vorbis decoder until Felipe implemented one. The gst-av is still missing some features that need to be implemented before it can be taken into use, mainly tags and streaming. I’ll report numbers about performance comparisons between MP3 and Ogg later.